Click the Contacts command on the Tools menu. Use the New -> Contact command on the File menu or task tray icon's right-click menu. Double-click a contact row in the Contacts List, or right-click the row and select the "Open Contact" command. Click the "..." button in the recipients field for an email reminder, SMS reminder, or meeting request. 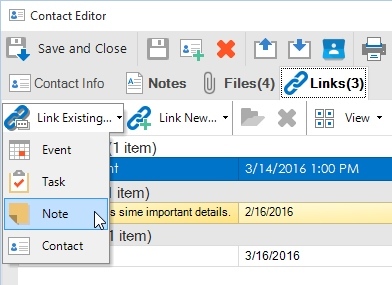 Create a new contact link via the Links tab in the various editor windows. Click a linked contact's name in the Details pane, or in the details area of the popup reminder window. The Contact Editor enables the complete details of a contact to be viewed or modified. This includes contact information, notes, and links to other items or files. In the Ultimate version, custom user-defined data can be entered. The currently displayed contact can be modified by selecting from a "Go To" drop-down list of contacts on the window's toolbar. 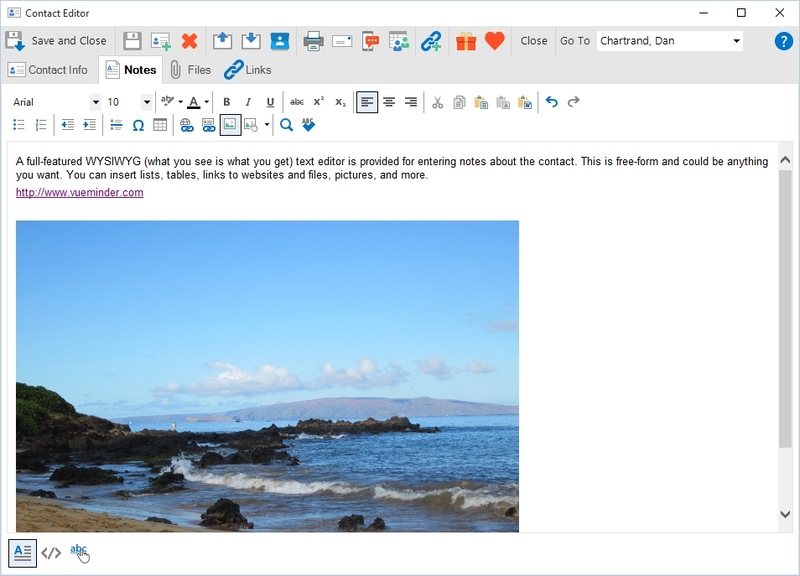 The Contact Editor window provides a number of buttons on its toolbar. Save and Close - This saves all changes on the Contact Editor window and closes it. The keyboard shortcut is Ctrl+S. Save - Saves the changes but leaves the Contact Editor open. New Contact - This saves the current contact's data and then create a new contact. The Contact Editor window will update to enable entry of the new contact's data. The keyboard shortcut is Ctrl+N. Delete Contact - This deletes the currently displayed contact. The keyboard shortcut is Ctrl+D. Export Contacts - This command exports your contacts to a CSV file. Many other contact management programs enable importing contacts from CSV files. Import Contacts - This command causes the Import Contacts window to be displayed, where you can import contact data from a CSV file, Excel spreadsheet, Outlook, or Google Mail. Sync Contacts with a Google Account - This command opens the Google Contact Sync window, where you can configure VueMinder to automatically sync contacts with your Google account. Print - This command will print the currently displayed contact's information. The keyboard shortcut it Ctrl+P. To print all contacts, use the Print command on the File menu and select "List Layout" with content of "Contacts". New Email - Initiates a new email to the currently displayed contact, using your default email client. The keyboard shortcut is Ctrl+E. New Text Message - Initiates a new text message to the currently displayed contact. The Send a Text Message window will appear, where a free-form text message can be typed and sent. The keyboard shortcut is Ctrl+T. Meeting Request to Contact - Initiates a new meeting request. The Meeting tab of the Event Editor window will be displayed and initialized with the currently displayed contact. After the meeting request has been defined, it will be sent via email to the contact. The keyboard shortcut is Ctrl+M. Link New Item to Contact - This button expands into commands for creating and linking a new event, task, or note to the currently displayed contact. The created items will appear on the Links tab after being saved. Add Birthday to Calendar - Clicking this button will cause a new yearly recurring event to be created and displayed in the Event Editor window. The event's starting date will match the date of birth specified in the Contact Editor window. The keyboard shortcut is Ctrl+Shift+B. Add Anniversary to Calendar - Clicking this button will cause a new yearly recurring event to be created and displayed in the Event Editor window. The event's starting date will match the anniversary date specified in the Contact Editor window. The keyboard shortcut is Ctrl+Shift+A. Close - Closes the Contact Editor. If there are unsaved changes, a message will appear asking if you'd like to save the changes. The keyboard shortcut is Alt+F4. Go To - To switch the window to a different contact, select the contact from the drop-down "Go To" list. If the current contact has been changes, you'll be prompted to save changes before the selected contact is opened. Help - Shows this page. The keyboard shortcut is F1. The Contact Info tab provides a number of inputs. These are described below. The contact's full name can be typed in the text box. In most cases, the contact's first, middle, and last names will be parsed from the entered text. If you need to specify a title or suffix, click the drop-down button. This enables each component of the contact's full name to be individually entered. A drop-down list if provided for title and suffix values, or you can type your own value in the input field. Changes made on the drop-down will be reflected in the contact's full name text box. This field is the value used for filing the contact information. 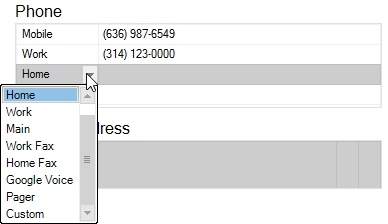 Each contact must have a unique "File As" value. 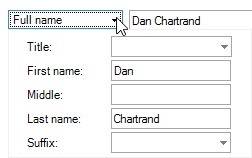 The File As value will typically be in the format of "Last Name, First Name", for easier sorting in the Contact List. However, you can select a different File As value from the drop-down list. The list of available entries for the File As field comes from the contact's full name. The Group/folder field can be used to group contacts. A drop-down list groups is populated with currently used group names. If the desired group name is not present in the drop-down list, you can use the keyboard to type a new group name. The Contact List also defaults to grouping contacts by this value. In addition to groups, contacts can also be associated with one or more categories. The list of categories is the same used by events, notes, and tasks. The Contact List includes a "Category" column that can be grouped, filtered, and sorted. When contact data sharing has been enabled via the Sharing Options, or when syncing with Google Contacts has been enabled, the "Private contact" box can be used to prevent a contact from syncing. The contact's information will be stored privately on your local computer. A picture can be added to the Contact Editor by clicking the empty picture area and selecting the Add Picture command. A file browser will be displayed where a picture can be selected. The picture will be automatically scaled to fit within the available space in the Contact Editor window. After adding a picture, you can remove or change the picture by clicking it again. Clicking the Change Picture command will enable a different picture to be selected. 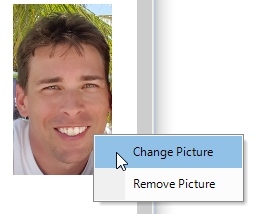 Clicking the Remove Picture command will revert the Contact Editor to showing an empty contact picture. 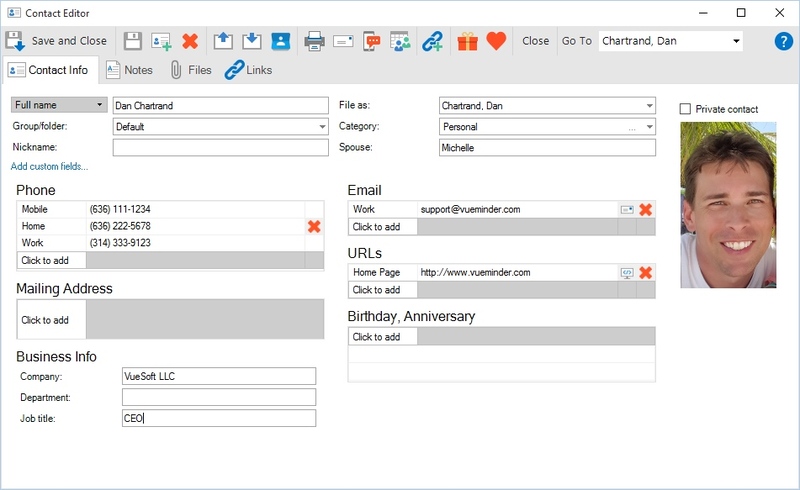 The Phone, Mailing Addresses, Email, URL, and Birthday/Anniversary areas of the Contact Editor support entry of any number of values. These areas will dynamically grow depending on how many values have been entered. If the areas become too large to fit in the Contact Editor window, a vertical scrollbar will appear. To add a new value, use the "Click to add" button on the last row. A drop-down list of default value types will appear. You can select an item from the drop-down list or enter your own custom label. To remove a previously added value, select or click its row. A red X button will appear on the right side of the row. Click the X button to remove the row. A row can also be deleted by clearing out its value. When a value is selected, it might have an additional "action button", depending on its value type. A mobile phone number will have an action button to initiate a text message to the contact. Email addresses will have an action button to initiate a new email to the contact. URLs will have an action button to open the URL in a web browser. 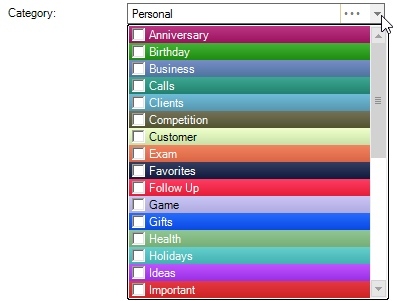 Birthdays and anniversaries will have an action button to add the date as a yearly recurring event to the calendar. 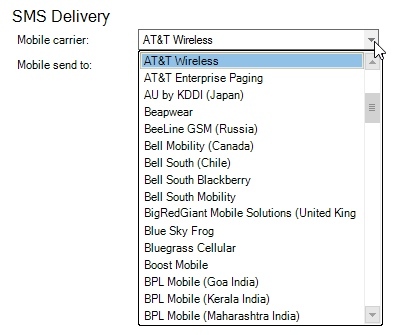 The "SMS Delivery" fields are only shown when the SMS/Voice options are configured to use your mobile carrier instead of the web-based SMS service. When using your own mobile carrier for SMS reminders, the contact's mobile phone number and mobile carrier should be specified. This data is used to automatically generate a mobile send-to address, which is the address text message reminders will be sent to. This also requires the contact's mobile carrier to offer an email-to-SMS gateway, which is a service offered by most mobile carriers in the United States, and is usually included in the service plan. However, some international mobile carriers don't provide email-to-SMS gateways, or charge extra to activate this service. If you're not sure, please check with your mobile carrier. You can also use the web-based SMS service, which doesn't require entry of each contact's mobile carrier and doesn't require the mobile carrier to provide an email-to-SMS gateway. In that case, the only information needed is the contact's mobile phone number. A cell phone button is provided on the right-side of the "Mobile phone #" field. Clicking this button will initiate a new text message to the contact, via the Send a Text Message window. The Notes tab enables free-form entry of notes for your contact. The notes can consist of anything you'd like, and can also include pictures or links. VueMinder Ultimate provides the ability to define custom data fields for contacts. Custom fields are integrated with the other contact data fields on the "Contact Info" tab of the Contact Editor. Custom data can also be imported or exported, and will sync over a local network. See the Custom Data documenation for more information. The Files tab can be used to attach (link) files and folders to the contact. File links can also be inserted into the Notes text, but the Files tab provides a number of different viewing modes, such as "List", "Details", and "Icons", and is more suitable when attaching a large number of files to a contact. To add a file or folder, click the "Add File" or "Add Folder" button. Files and folders can also be dragged-and-dropped onto the Files tab. Selected files and folders can be removed by clicking the Remove button. Multiple files can be selected and removed at the same time by dragging the selection rectangle around the desired files or holding the Ctrl key while clicking the files. You can also press the Delete key or right-click the file and select "Remove" from the popup menu. You'll be prompted to confirm removal of the file. Removing a file from a contact does not delete the actual file, it just removes the link. To open file, select the file by clicking it, and then click the Open button. If multiple files are selected when the Open button is clicked, all selected files will be opened. Files can also be opened by double-clicking or right-clicking and selecting the "Open" command from the popup menu. The View button enables selection of different view types. These are very similar to the view types provided in Windows Explorer. The default view type is "Icons". To select a different view, click the View button and then select the desired view type from the drop-down menu. Below is an example of the "Details" view. In this view, items can also be sorted by clicking the column header. 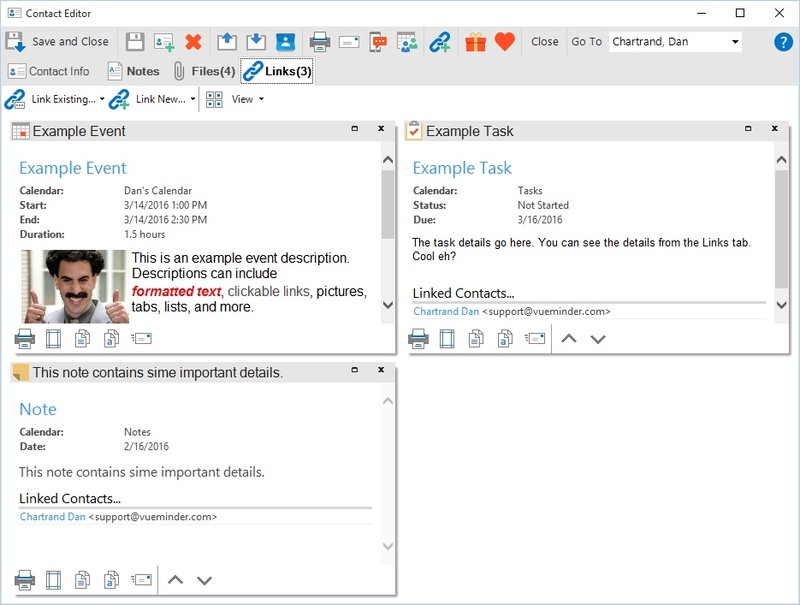 The Links tab provides the ability to define 2-way links between events, tasks, notes, and contacts. For example, tasks and events could be linked to an associated contact. When a link is established, it becomes 2-directional - meaning the association between the items can be viewed or removed from either item's editor window, via the "Links" tab. The tab can present all associated links in a single view, providing instant access to the details you need, such as an associated contact's phone number and address. The "Links" tab shows currently defined links and enables the addition of links to other events, tasks, notes, and contacts. Links can also be removed. Each link is shown within a panel when the View option is set to "Tiles". If there are many links, the View option can be set to "List", enabling more links to be seen at one time. To open an associated item, click its name in the Tile view, or double-click its row in the List view. This will open the linked item in a separate editor window. Any changes made to the linked item will be dynamically refreshed in the Links tabs. To link an item with another item, click the appropriate "Link Existing" or "Link New" button at the top of the Links tab. When linking to an existing item, the Add a Link window will appear, containing a list that can be searched or filtered, and columns can be shown or hidden by right-clicking the column header. To select an item for linking, click its row. Multiple items can be selected by holding the Ctrl or Shift keys while clicking rows. When finished, click the OK button to link to the selected item(s). To remove a linked item when viewing items by Tile, click the "X" in the upper-right corner of the item's tile. If viewing by List, click the linked item's row to select it, and then press the Delete key or click the red X button at the top of the Links tab. A message will display asking to confirm removal of the link. When the link is removed, it will also be removed from the associated item, since links are bi-directional.